Venturing west to the iconic Blue Mountains town of Katoomba, Shawn launched without pause into the first of numerous fine dining ventures, transforming a local café into one of the region’s most decorated restaurants; as head chef of Fresh Pallet, Shawn earned instant recognition attracting a variety of awards and media attention. This new wealth of knowledge armed Shawn with priceless skills forging the way to craft several more award-winning boutique resorts and restaurants. “I have been fortunate to be able to control my career, including where I work and whom I work with. 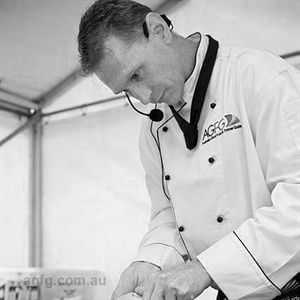 I’ve catered aboard whale watching tour vessels in Port Stephens, worked as a chef in internationally acclaimed Peppers and Novotel Resorts, and excelled in Brisbane-based award winning restaurants, Boroughs and Jellyfish,” explains Shawn Sheather. Recently Shawn’s traditional role as chef has changed with his appointment by the Australian Good Food & Travel Guide to Chef in Residence. “In my role here I get to call on both chef skills and industry acumen - best of all, I still get to cook!” Throughout his career, Shawn has created exceptional seasonal menus and truly inspiring dishes. His trend of excellence will continue as he develops original recipes and shares them in the AGFG Recipe section. I have always loved the service industry and taken pride in exceeding guest expectations. For me a successful night in the kitchen is one that results in diners discovering new and exciting tastes, textures and emotions. Modern Australian with indigenous characteristics. My menus always have a natural aspect. I have used many regional as well as native, traditional ingredients. One of my awarded dishes is my rare paperbark smoked kangaroo, seared then lightly smoked and served resting in a nutted pesto on a parsnip puree with a warm tomato and fennel salsa and a juniper berry jus. It goes down well, and it’s a great dish with which to introduce kangaroo to people’s palates. I must say it’s star anise; I find it under-utilised in most kitchens. I have used it in so many forms, from a simple entrée of star anise infused pork belly with caramelised scallops through to a delectable dessert of caramelised fig with shaved black truffle over toasted brioche with an organic honey infused mascarpone. Keep it clean, tidy up as you go and always have a sorted, organised cool room and dry store. Then there’s the pressed uniform and polished shoes. Oh, and sharp knives. To sum it up, be professional! Early in my career it was the pioneers of Sydney’s dining scene, guys like Peter Doyle and Luke Mangan. These days it’s hard to go past the Heston style of cooking, so I respect guys like Brent Savage who are continuing to create experiences for diners. Everyone is on a journey; they are just visiting you on their journey so you need to make a great experience for them, create a memory. Flaked salt! And fresh ground pepper. Sweetbreads – the old school guys love it. So many to recall, but one of my favourites is my strawberry risotto with fine shavings of mint, double cream bitter chocolate ice-cream, and candied orange powder.